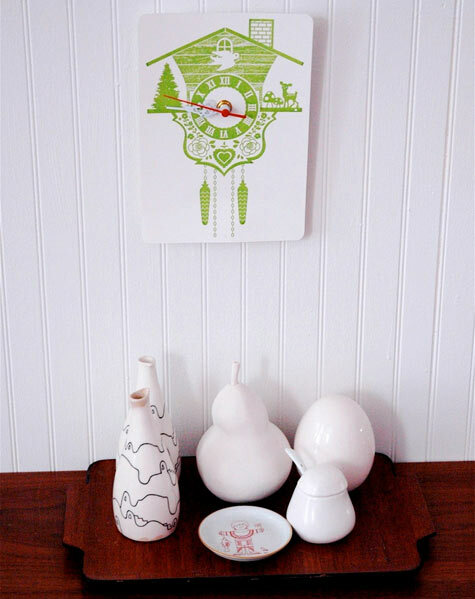 here at d*s i think it’s safe to say we’re all huge fans of lisa congdon (even ac). over the past year it’s been so great to share a sneak peek into her san francisco apartment, and even a peek into what she cooks while she’s in her home kitchen. but we’ve yet to get a good look at what her newly rearranged and restyled kitchen looks like- so anne and i thought it would be great to get a little update to see what’s new around lisa’s colorful home. thankfully she was kind enough to share her kitchen updates with us here today so our first sneak peek today is a focused look at lisa’s kitchen! i hope you’ll enjoy it as much as we did. stay tuned for another sneak peek today at 12pm. as always, you can click here for additional, full-sized images of lisa’s updated kitchen. “I am really lucky to have such a large kitchen for an 900 square foot San Francisco apartment. Recently I decided to give my kitchen a make over. Eventually I’d like to gut the place and start from scratch (my kitchen is not well designed for function and storage—especially given its size), but I don’t have that kind of money right now so I decided to make some simpler changes. 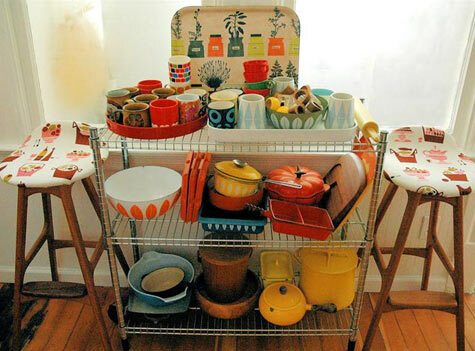 The inspiration for the changes I made was my collections: I collect mid-century kitchen ware, mostly Japanese and Scandinavian with a smattering of American kitsch. I decided that my collectibles—all of which are brightly colored—were not standing out against the formerly orange walls. I wanted to make them the focal point of the room. I painted the walls white and it’s made all the difference. I also installed some glass shelves near a window for some of my collection (thank you, Ikea! ), hung a plate wall (which you can read more about here), and added some other bursts of color around the room. I also decided instead of curtains I needed to let in as much light as possible (my apartment is really dark overall) and so I frosted the windows instead. Another element I really like is the small chalkboard wall I added with a few coats of chalkboard paint. It’s a place for me to keep track of what I need to remember. I used a small Ikea shelf as the chalk and eraser tray right at the bottom. I recovered my 1970’s Danish chairs and stools in bright upholstery fabric to add even more color. Incidentally, my one-of-a-kind kitchen table is by furniture designer Rosie Hanna. The plates above my refrigerator were a gift from (and made especially for me by) Diana Fayt. My kitchen is now my new favorite room in my house. I love it so much I actually do the dishes and scrub down the counters everyday. I hope you have enjoyed your peek. I’ve always loved Lisa’s apartment – although I’ve only ever seen pictures of it! 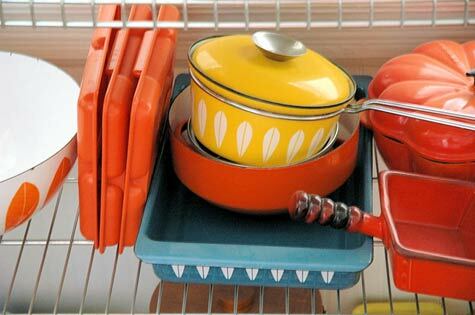 her collection of vintage kitchen ware is fabulous. Oh! Oh! I love this. I have a white kitchen too, with some pops of color. Wondering if Lisa might share what white she used on the walls? The beadboard looks really lovely in that shade. Absolutely beautiful! How did you frost the glass in the window? I’ve been looking for a plain frosted film for our bathroom for the exact same reason – too dark with a curtain, but obviously need some privacy. i love your kitchen. i have a pair (in black and different heights) of the wood candlesticks you show on the shelf. i got them in a box lot at an auction…do you know any more about them(age, company, etc.)? thanks! This kitchen is amazing. 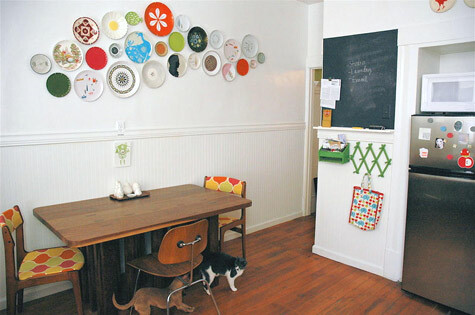 The plate wall caught my eye right away and I was immediately inspired to do it in my own kitchen! I love it. Thanks for sharing this. Love it! It’s so quaint and organized. Note to self…SELF!…start organizing kitchen! I’m just dying over the whale plate. HOLY SMOKES, I NEED one. I’d love to have my morning coffee in that kitchen. the white walls really work — it is so sunny and inviting. love the plate wall, what a beautiful collection! Jnett: I bought some frost in a can! it’s easy to apply! your vintage dansk is great. where did you find that big yellow dansk pot? maia: I have found all my pots at thrift stores. this one was a gift from my friend claire who found it…yup, you guessed it…a thrift store! Great job with the kitchen Lisa, I really love your plate wall as your choice of artwork. Could you tell me where you bought the black and yellow pair print on the wall? Thanks! if my kitchen looked like this, i would never, ever leave it. So cheerful : ) Anyone know who did the pear print? the kitchen is outasight! where did the glass shelves with the metal anchors come from! beautious! best sneak peak I’ve seen here it a long time. I love your kitchen. Lisa – I love the little wood tray that your ceramics collection is sitting on. Did that come from somewhere in particular, or is that also a thrift find? Thanks for the link to the pear print.. I’m trying to put together a collage of posters for my sunny new breakfast room (lots of keep-calm pieces already)! Ryan, I got it at a Japanese market in SF that is now out of business…Hrmph. I love the plates and all of the orange and blue. I have to know – where did you find the cuckoo clock?! :-o that ceramic pear in the last picture is absolutely amazing! well, everything is, really. but that pear… want! they have lots of great stuff! This plate wall haunts me. It is everywhere and it is wonderful! As is the whole stunning house. This kitchen is adorable! It’s homey and comfortable and bright and clean – everything a kitchen is supposed to be. And I love that nothing that’s in here is out of reach for the ordinary person – I could similar things in my own kitchen, and I plan on it. Such a refreshing change from the usual dark, granite-topped, super-expensive show-off kitchens that are so popular these days. Love the plates! 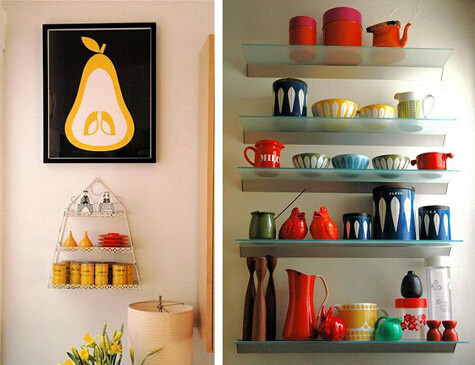 I’m obsessed with vintage dinnerware… great collection! Wow, the plate wall. It’s perfect. I just did a similar thing with a free-form pattern (i.e. not symmetrical a la Kelly Wearstler) but spaced the plates far apart – now I see that nice, tight grouping and am having serious doubts about mine. Whole room looks right on! I really love that little ceramic pear in the last picture! I saw one like it on an early post too. Where did you get it? What a great way to use cool plates. The colors are great. You could even make some yourself. I must make some of them now. Love it. *sigh* dream kitchen – a thousand thanks for showing us that there’s no such thing as too many colors or too many styles. so many times i feel like i’m “not allowed” to mix my color palet. this shows it CAN be done! I love all the juicy colors, especially against the white. does anyone know where to get a kitchen cart like that? Ive been searching and searching and all i can find is tall skinny ones! Love the Plates on the wall! Super cool! 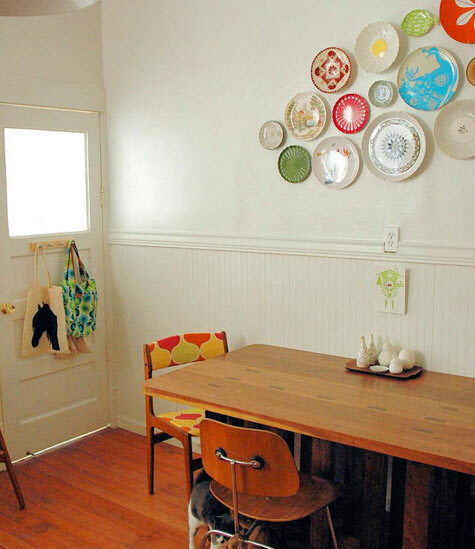 Love the Plates on the Wall – SUPER COOL! Beautiful, I love it! I am a mad collector of the psychedelic coffee cups, trays, canisters, and things, and I just love to see this! I am in LOVE!!! I’m going to get started on recreating this in my own kitchen today!!! I am excited about the fact that it’s a way to store things in a beautiful and pleasing way! Lovely, so colorful and vibrant and playful! She is so creative it hurts! You got to Love Lisa! LOVE the plates on the wall! Such a nice refresher on the traditional way of doing it. 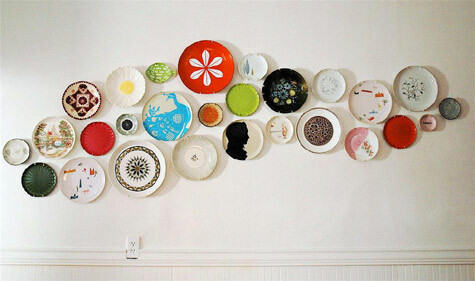 I love how she created an art piece from plates. What an imaginative idea.